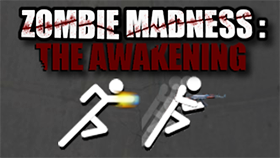 Madness Accelerant is an action game developed by TomFulp, MindChamber and Krinkels. This game has cute graphics, suitable for those who like shooter. You can experience this game on your browser because it is a flash game. In this game you will control a soldier and your mission is to destroy all the enemies that are blocking your way. You will face a lot of enemies and a giant dragon. You will have to fight with it, run away from it and find a way to destroy it. The interesting part of this game is you can use a lot of weapons: pistols, machine guns, shortguns, firearms ... And even you can use your hand to punch the enemy. Each weapon will have a limited number of ammunition. When you run out of ammunition, the weapon will disappear. You can kill enemies and pick up their weapons to use. Use D to swap weapons. Use S to jump and double jump. You can control the character in two ways: keyboard / pad or mouse.